What to expect from Crystal Clear Microdermabrasion Facial? A results driven facial compared to a relaxing, pampering treatment, expect fabulous results on problematic skin from just one session. Less massage moves and strokes and more professional exfoliation and working with epidermal layers is what you can expect. You can expect skin to be slightly red and inflamed after the facial and increased sensitivity to sun, both of which can be dealt with using a protective SPF of 15 or above. For best results, use skincare as recommended by your trained therapist for at least 2 weeks after the treatment. Most clients experience noticeable results within 3 treatments, from fewer wrinkles and fine lines to smoother texture and reduced breakouts. 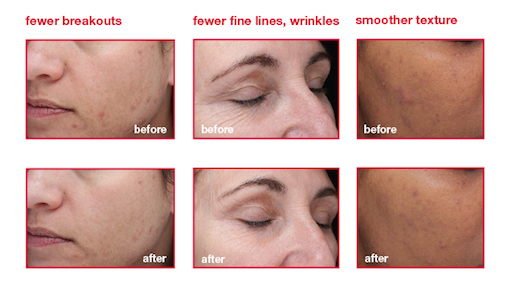 Results will vary depending on your skin condition and how frequently you receive Microdermabrasion treatments. Who is Microdermabrasion Facial for? Suitable for all skin types, Crystal Clear’s Microdermabrasion Facial can be used to treat a range of skin problems on the face, hand and body including reviving ageing complexions and assisting problem skin on the road to recovery. Crystal Clear Microdermabrasion Facial aims to slough off the top most layer of the skin and encourage the layer beneath to produce new skin cells, collagen and elastin. Hence making the treatment perfect for those suffering from fine lines, wrinkles, sun spots, hyperpigmentation, acne scars, uneven skin tone, dull-dehydrated skin and so on. Microdermabrasion is one of the most popular professional skincare services today because they can improve the quality, texture and tone of the skin. Your professional skin therapist can assess your skin’s suitability for a MDA facial with a skin analysis. The treatment starts by bombarding the skin with a controlled stream of finely ground crystals, pumped through a sterile, disposable hand-piece placed directly onto the surface of the treatment area. Together, the speed and abrasive nature of the crystals are then vacuumed back up along with the exfoliated layers of skin, encouraging collagen re-growth, boosting circulation and improving lymphatic drainage along the way. The gentle vacuum action also achieved an immediate lifting effect on tired muscles so skin looks instantly rejuvenated. How should i prepare for Microdermabrasion Treatment? As a general rule of thumb, it is good practice to discontinue the use of prescribed exfoliants such as Retin-A and Renova, at 48 hours prior to and during microdermabrasion treatments. I used to take Isotretinoin. I am pregnant. Can i receive Microdermabrasion Treatment? No. Your skin may be too sensitive for the abrasive nature of the facial. This will impact the frequency and results of the microdermabrasion facial treatments. Ideally a series of treatments are performed over a three to six week period, followed by maintenance treatments once a month. Immediately after the treatment, skin may appear red and flushed. As your skin goes through the renewal process, it is normal to experience dryness, redness and tightness, as well as some peeling or flaking within a week. You may also notice a temporarily more pronounced appearance of pigmentation as it rises to the skins surface. You should continue to moisturise and apply an SPF daily. Direct sun exposure should be avoided immediately after your treatment.